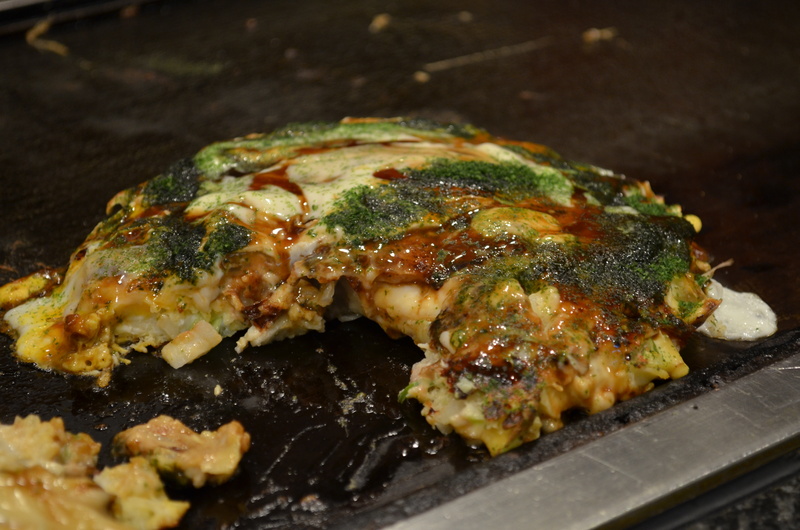 Okonomiyaki supposedly originated in Osaka, so during our visit there, we stopped by Mizuno Okonomiyaki, one of the city’s most popular (and still family-run) spots in town. 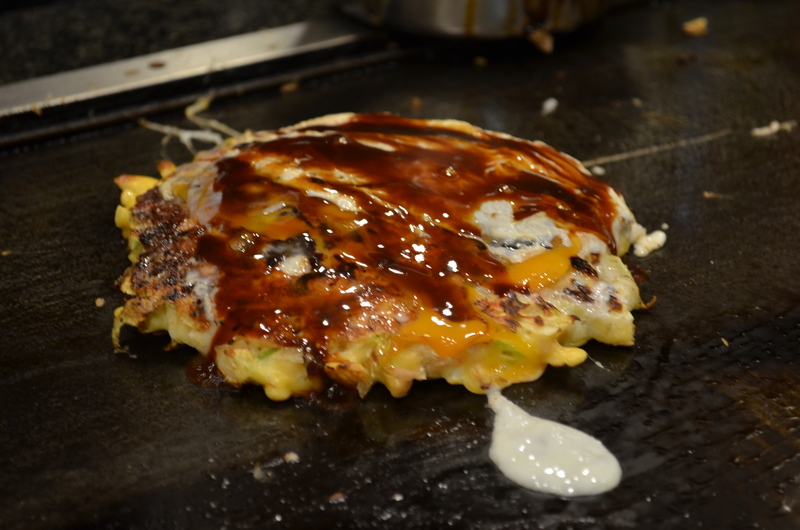 In a literal sense, okonomiyaki is a hodge-podge of ingredients mixed together and grilled on a flat-top (okonomi means something like ‘what you want’ and yaki means ‘grilled’). 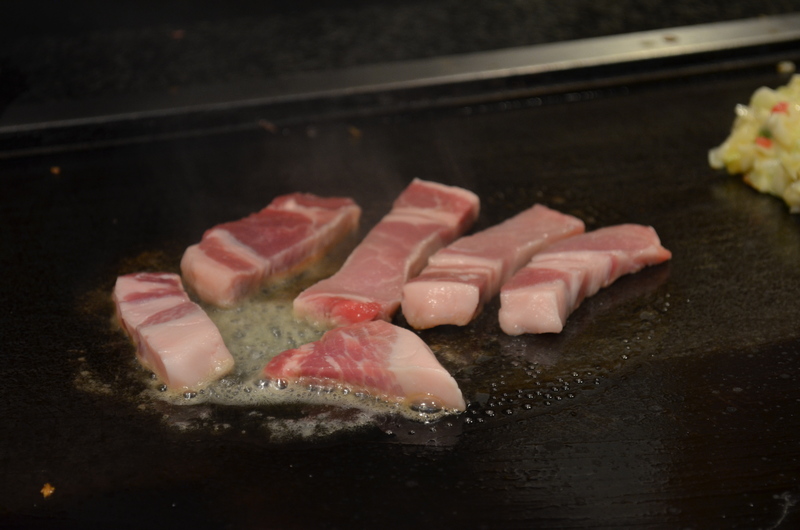 We waited about twenty minutes for a seat around the bar at Mizuno, which has a little foyer near the door where, towards the end of your wait, you can stand and ogle the pancakes being made and savor the robust smoke of charred bonito flakes and burning mayo. 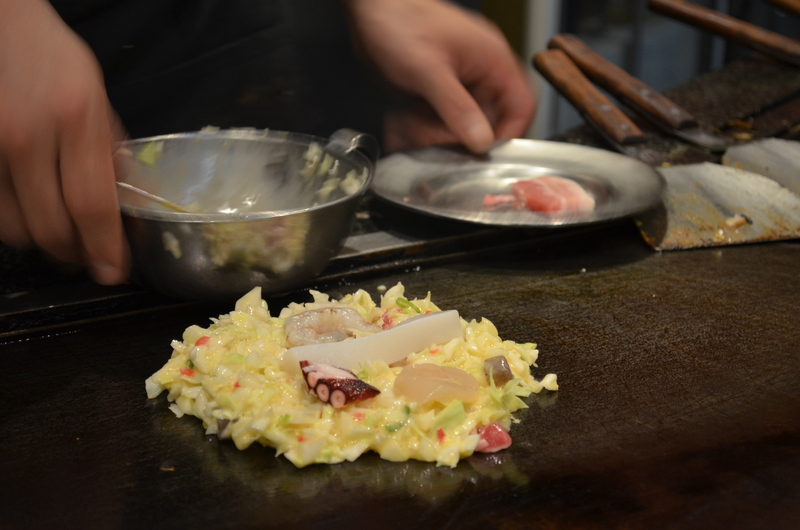 After we got seated, we ordered a mixed seafood (octopus, squid, scallop, and shrimp) okonomiyaki and a pork belly one. 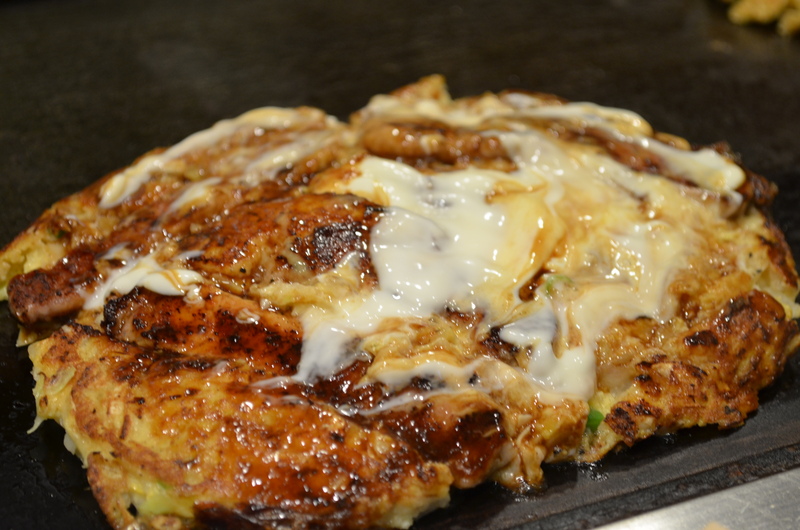 The batter is a serious medley of gooey batter, with a lot of lettuce, speckled with green onions, and a viscosity provided by eggs and grated Japanese yam. 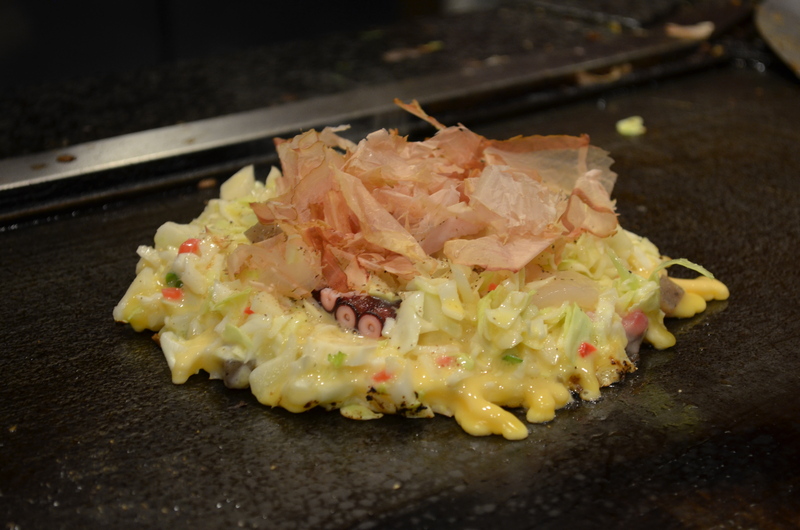 The seafood one is then topped with bonito flakes, flipped, and an egg is cracked on top, along with a layer of sauce. Then, once flipped, cracked egg, mayonnaise sauce and green tea powder. 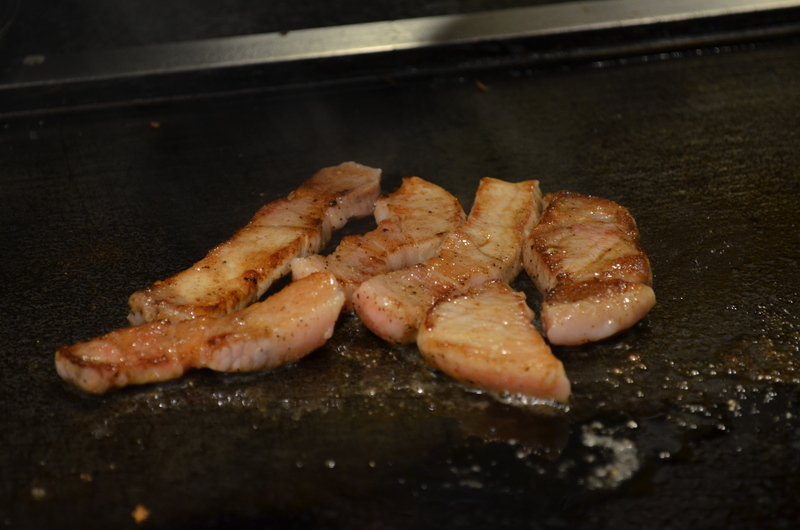 The pork belly is cooked first, before being added to the pancake. The first handful of bites are unquestionably phenomenal, hot and crisped on the grill and oozing with savory notes and umami. These bad boys are hearty though, and my pace of consumption slowed considerably about halfway through my okonomiyaki, by virtue of the same melting mayonnaise and egg and fatty slabs of pork belly. 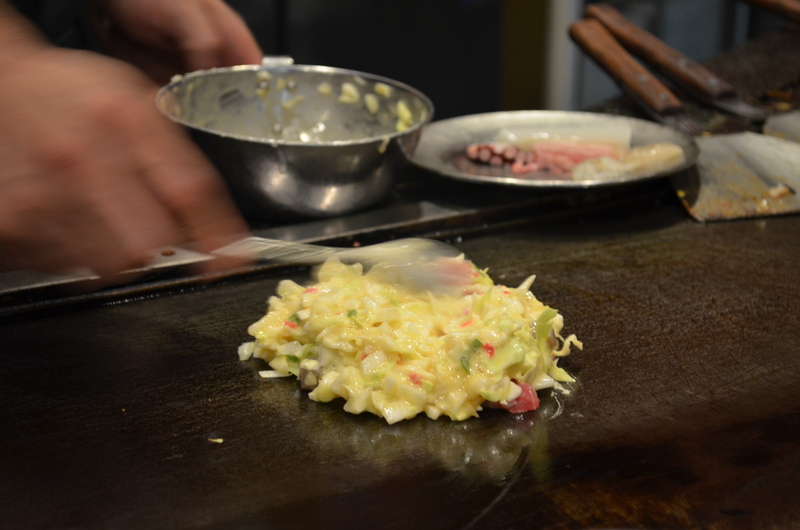 There are a few modan-yaki options, in which noodles serve as the base of the pancake (instead of the lettuce blend). 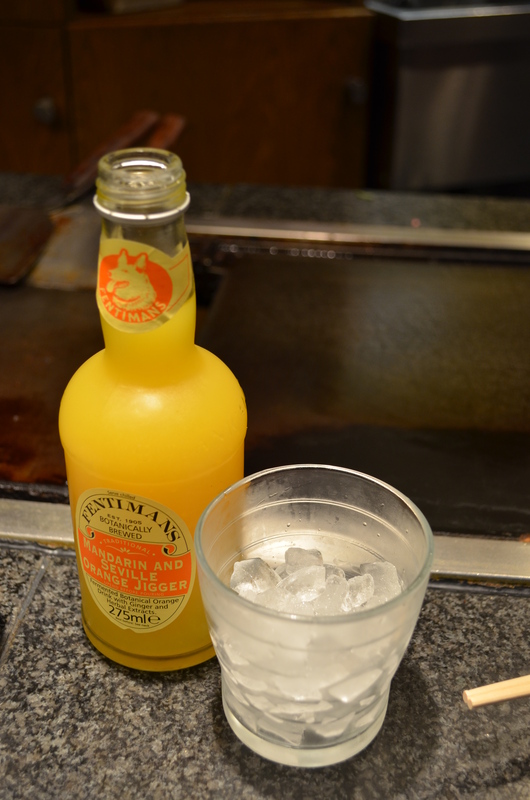 They had a nice bottle of Fentiman’s orange jigger, a tart, fizzy soda that really helped with the okonomiyaki. Mizuno was an interesting, new experience (and a cool little space) that I enjoyed, but given my existing apathy towards its Japanese cousin, takoyaki, it’s not something I’m super crazy about.